The papers have been on fire (sadly not literally, despite the heatwave) with speculation about whether The Royal Baby would be a boy or a girl. I’m not going to write at length about the problems with gender binarism or the ridiculous superstitions used to justify the occasional success of guessing the outcome of something that’s more or less a coin toss. You can (and should) read about that stuff yourself. I’m just going to look at some of the colour-coded reactions to the joyful event. A few days ago it was announced that the fountains of Trafalgar Square [would] be lit in pink or blue, depending on the gender of the newborn. And lo, this came to pass, as the Tower Of London turned blue, the fountain at Trafalgar Square turned blue, and the London Eye turned red, white and blue (this last just to taunt us with the reminder that it’s actually possible to celebrate the birth of a human using other colours). I confess that the idea of blue fountains somehow annoyed me less than pink fountains would have done; I think it’s just because blue is less marked. This special version of the coin comes in a beautiful pink pouch, with a matching pink gift card that can be made even more special with a personalised message. This charmingly presented gift set is an adorable baby gift for a new little girl, and one that she will treasure throughout her life. The coin comes housed in a drawstring pouch that, in turn, is held in a pleasingly illustrated gift card. Both of these are in the charming pale blue associated with newborn baby boys, making it the perfect birth or christening gift for sons, grandsons, nephews, brothers or any special little boy you know. The differences are interesting. The description for girls gushes about how it’s beautiful, colour-coordinated, personalised, and adorable, and the focus is on the little girl treasuring the pretty coin; the description for boys picks out the practicality of the bag, the pleasingly illustrated (not ‘beautiful’ or ‘matching’) gift card, and suggests that it’s a birth or christening gift, not an adorable baby gift (that is, more formal and objective language for the boys, more subjective and cutesy for the girls). There’s something odd going on with the way the pink and blue themselves are described/mentioned, too: pink gets mentioned twice and doesn’t have to be explained as being Girl Colour; blue gets mentioned only once, reduced to ‘pale blue’, and referred to with the distancing ‘associated with newborn baby boys’ (only newborn baby boys need a colour, and we’re not doing the associating, it’s just a tradition, you can ignore it if you want). Of course it’s a morass of pastel pink and blue, but the surprising thing is how odd it looks to see baby clothes emblazoned with “little prince”. “Little princess” is ubiquitous on pink baby clothes, but clothes aimed at boys more usually seem to feature words like “hero”, “soldier”, “little man”, or else words glorifying things that would be naughtiness in girls: “little monkey”, “little monster”, etc. I also note that it’s “Mummy’s little prince”: at some point I’d like to do a fuller examination of my observation that in babywear, boys are nearly always “Mummy’s little X” and girls are nearly always “Daddy’s little X”. Is this some kind of weird Oedipus/Electra thing going on? 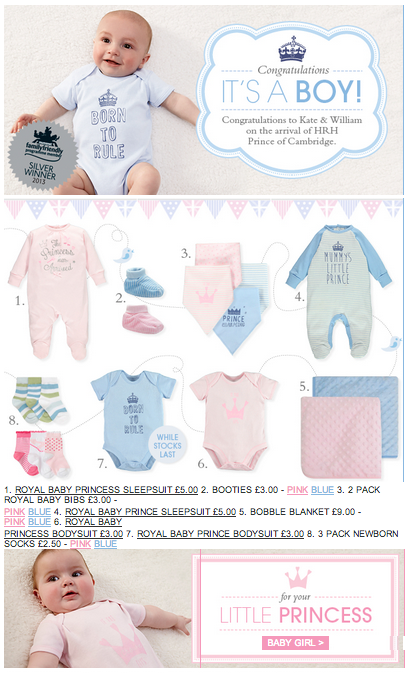 The really interesting one, though, is the “Born to Rule” babygro, only available in blue (marked ‘while stocks last’ in the marketing email, it already appears to have vanished from Matalan’s website). Perhaps in all the excitement over the new prince they’ve forgotten that for the last 61 years we’ve been ruled by a woman.